Is the U.S. tort system in crisis? CBS television's 60 Minutes has said the tort system metes out "jackpot justice," and Newsweek has called America a "Lawsuit Hell." Other observers of the legal system, however, argue that the tort crisis is a myth. Although both sides of the debate rely primarily on anecdote and the selective use of evidence, a sound diagnosis of the tort system requires a rigorous analysis of hard data, not a retelling of sensationalistic sound bites.In Judge and Jury: American Tort Law on Trial, economists Eric Helland and Alexander Tabarrok present their study of tens of thousands of tort cases from across the United States. The result is the most complete picture of the U.S. system of civil justice to date. 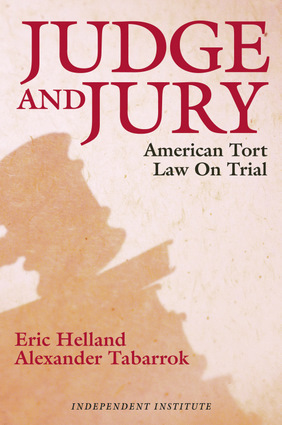 Examining three of the key players of the tort system (juries, judges, and lawyers), Helland and Tabarrok conclude that the tort system is badly broken in some respects but functions surprisingly well in others. Eric Helland is professor of economics at Claremont McKenna College and former Senior Economist on the President’s Council of Economic Advisors. He received his PhD in economics from Washington University. His articles have appeared in the American Law and Economics Review, Contemporary Economic Policy, The Journal of Law and Economics, and Journal of Legal Studies. Alexander Tabarrok is research director for The Independent Institute, assistant editor of The Independent Review, and associate professor of economics at George Mason University. Dr. Tabarrok’s books include Entrepreneurial Economics, Changing the Guard, and The Voluntary City; he is also the coauthor of www.FDAReview.org.